Ever been on a horse that likes to go and go, who doesn't want to slow down, who pulls and pulls because you pull and pull to try to slow him down? I've come to realize that among some endurance riders, the WHOA is highly underrated. A lot of horses learn to GO before they learn how to WHOA. Sometimes it's just easier to let the horse go fast than to take the time to teach him (or keep reinforcing, if the horse is not a fast learner) the WHOA before you let him GO. The riders hang on the horse's mouth, which makes him harder-mouthed, and less likely to respond by slowing down when you pull. Just going fast can be fun, but if the horse is too young to be going too fast too soon, or if he's coming back from an injury, or if he's the kind of horse that isn't smart enough to slow down on his own when he needs a breather, it can be very destructive. Some horses are hardwired to go fast till they drop. Some horses just have no brakes. 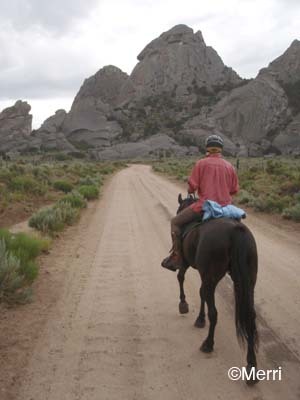 It can be especially detrimental to you and your horse if a whoa is needed quickly but there are no brakes. Sometimes, when your horse is out of control, or when he has no brakes, or when fighting with him isn't getting him to slow down and it's wearing both of you out, it's time to stop what you're doing, and go back to basics. That's what Steph did with Batman. Batman likes to go FAST. It's what he's always known. It's fun, but he's one who doesn't know when to slow down and he doesn't know WHOA very well; he knows how to pull and keep going fast. Steph had Connie get on him a couple of times; Connie is great at getting a horse to slow down, put his head down, and start responding to leg rather than hands pulling on his mouth. Afterwards, Steph continued this method by using the bitting rig in the round pen. Batman is not one of those fast learners. In fact, we say he's a bit... dumb... (but he's very sweet, and he wants to do good)... but that just means you have to reinforce things a lot, even when he learns something into a habit, or he'll forget it. The first time Steph put the Pessoa bitting rig on him and asked him to move around the round pen, Batman pulled and pulled and pulled with his head up and braced against the bit. "He kept going - 'ow! ow! ow! ow!' and when he would drop his head and get relief, he'd go 'Ahhhh...' - and then he'd put his head back up in the air, 'ow! ow! ow!'" Batman didn't really completely figure it out that first day. But the second day was easier. He resisted and pulled less, he dropped his head more; it took him less time to remember that if he dropped his head the pulling stopped. Steph's been working with him in the round pen with the bitting rig every time before she rides him; and then she rides him in draw reins - and it's showing. 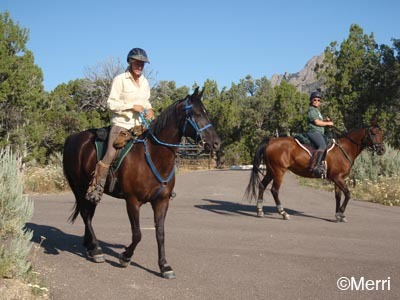 Even Connie noticed this weekend that the muscling in Batman's neck is starting to change - it's building up on top for the more curved neck position; and, flying home to our camp on the road to City of Rocks at a 14 mph trot on Sunday, Batman was moving along relaxed, at this speed, with horses in front of him, and with Steph exerting no pulling contact on the reins at all (and no draw reins). 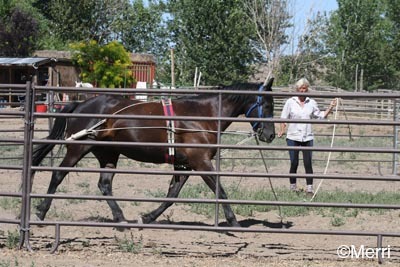 This method may not be liked by everybody, nor will it work with every horse - you have to find what works right for your horse; it also depends on what kind of learner your horse is. This bitting rig works on Batman, and he the kind of horse that you'll have to keep reminding and reinforcing a habit even after he learns it; and he'll probably, at times in an endurance ride, forget what he's learned. But he's getting it. He's gettin' his WHOA on.